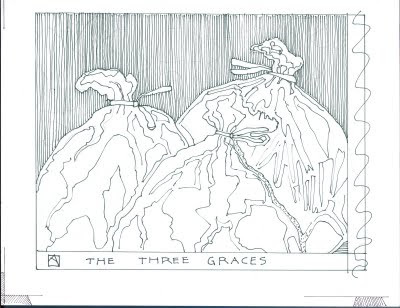 I'm trying to get through a backlog of printing, but I've been putting a little time into my trash bag print/project. Here is a reworked sketch; with eventual registration marks on the drawing so subsequent copies or tracings will all match up. 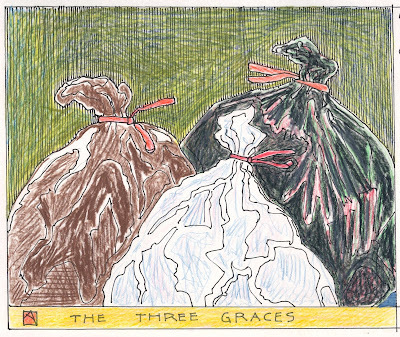 And at the top is a simple xerox of the above, with some colored pencils filling in the shapes to get an idea of what colors and values might look like. Still working on how many blocks and colors I'll need to achieve the look I want. 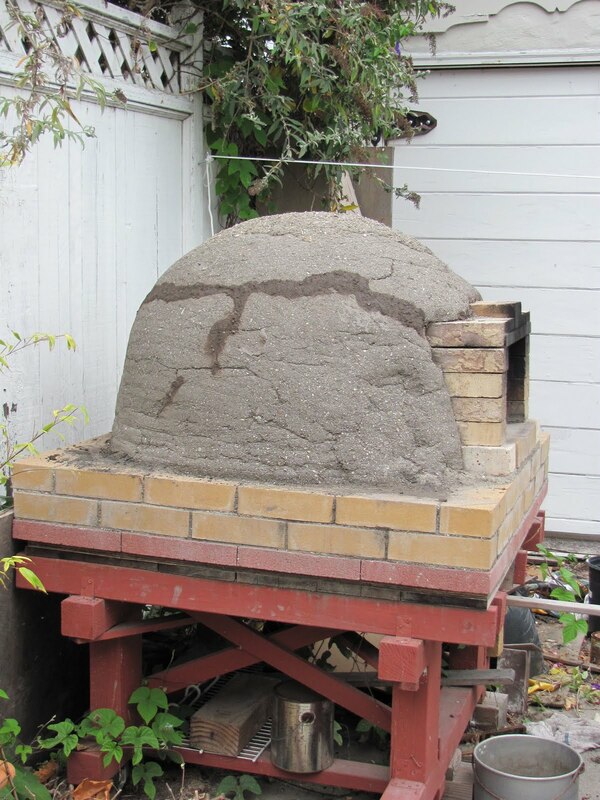 Since far and away the most interest my art blog generates is for my home-made, adobe bread and pizza oven I thought I should reward all those random readers with an oven update. 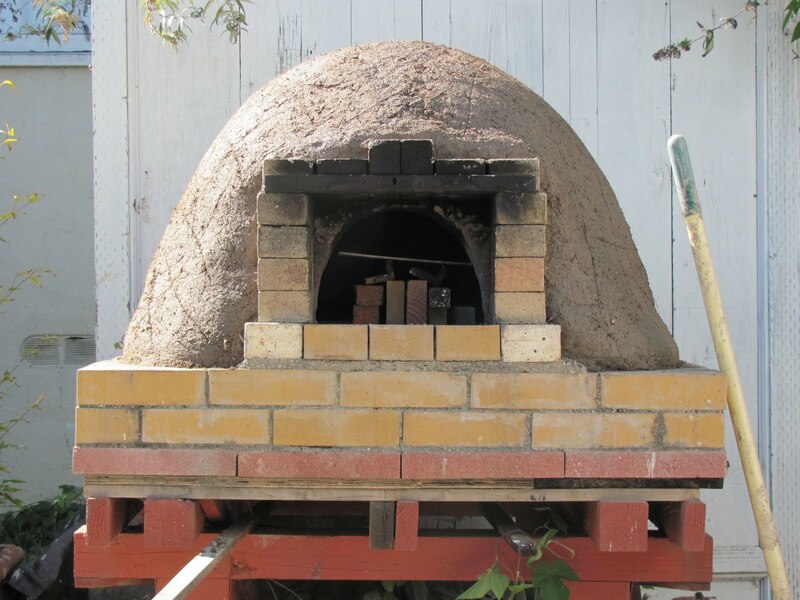 As I said previously in my last Pizza Post, it is functional as it is now but would stay hot longer if it was better insulated. For a cob/adobe oven; insulation means: dirt/sand/clay mix but made into a slip by adding more water and then folding in hay or grass or sawdust. I had a big bag of woodshavings and sawdust from a neighbor's woodshop so that's what I used but I added some dried cut stemmy grass to give it a little more structural stablity. First I made some moist clay/soil mix and patched the few cracks that exist in the insulation layer I had built previously. 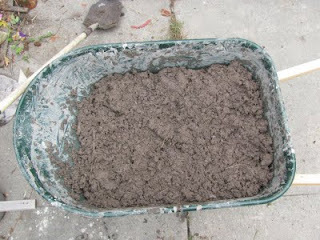 Then, I mixed up a wheelbarrow's worth of woodshavings/sawdust with clay/mud slip. 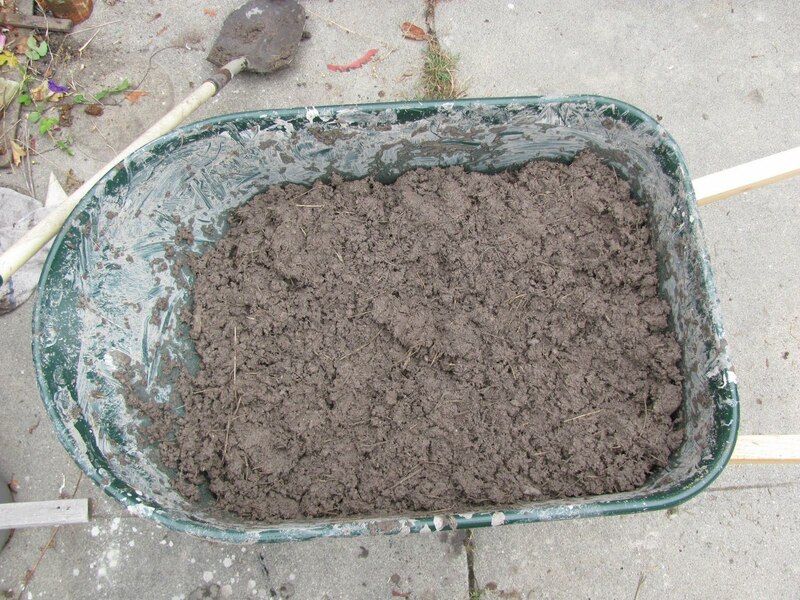 I mixed it with a shovel and then threw in a bucket of dried grass/stemmy clippings. (Straw would have been better but I had a pile of cut grass). Then I added about a two-inch layer, fistful at a time going around the base and then up the sides to meet a layer I had already added to the top. 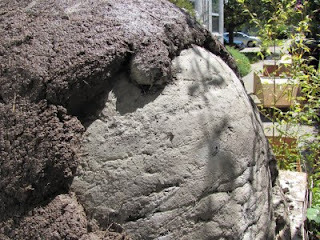 By slapping it on it didn't slump and the grassy bits helped meld the fistfuls together. I gently smoothed the surface and then added some scratches in the surface to help the next layer adhere/stick. Now, I'll let it dry for a day or two and decide if I want to try to add a finish or smoother layer. It will take several days to dry out and I'll post again about how it works then. 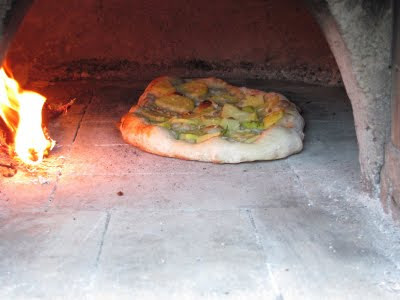 But here is a photo of my last pizza: Potato and leek with garlic oil. It was tasty. 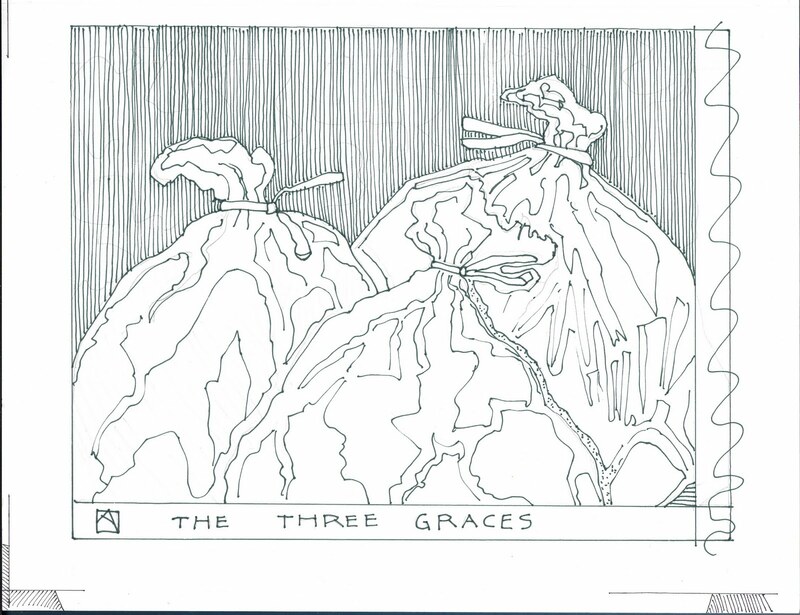 trash bag doodle No 1. I have quite a few ideas gurgling away in the back of my mind/psyche. Some are pretty ambitious and involved and not something I want to tackle as I get ready to relocate to Italy (I leave in 2 weeks). But although I have a few simpler ideas I could probably get done before I leave, I haven't yet really jumped into anything with enthusiasm. 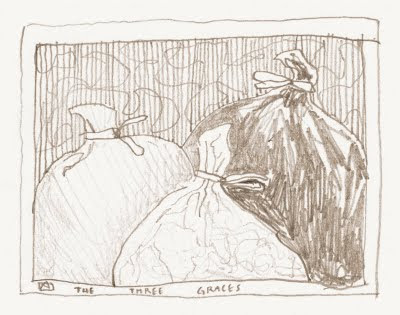 In the meanwhile, I'm cleaning out the house and filling the recycling bins with papers and trash. Needing to get out of the house, I grabbed my sketchbook and headed downtown. Not surprisingly, I've been drawing trash bags. Mostly in threes. Sometimes just one. Never two. 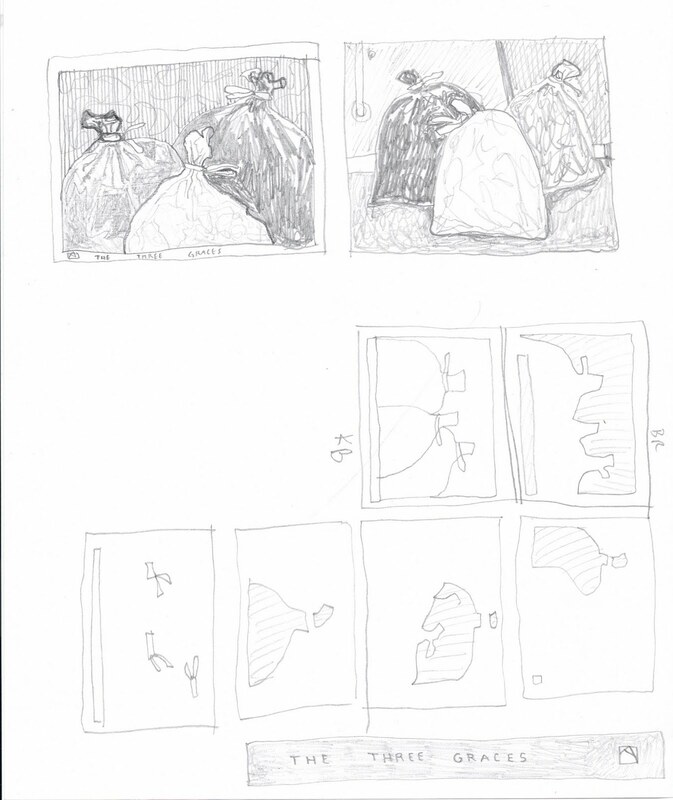 I like the one on the left as a possible woodblock print and started to think about printing logistics. The doodles on the bottom are thoughts about color separations and blocks. I would try this with six or seven blocks--with or without a keyblock. However, this particular image could probably be tackled as a REDUCTION print, using just one block, gradually printing and then carving away from the image. I could go light to dark and progressively overlap colors to get the darks needed for the black and dark plastic. I've never done a reduction print--and while it would solve all sorts of registration issues and would probably be faster; it would mean destroying the block as I go along, with no chance to go back and reprint areas later if they are too light or the wrong shade. 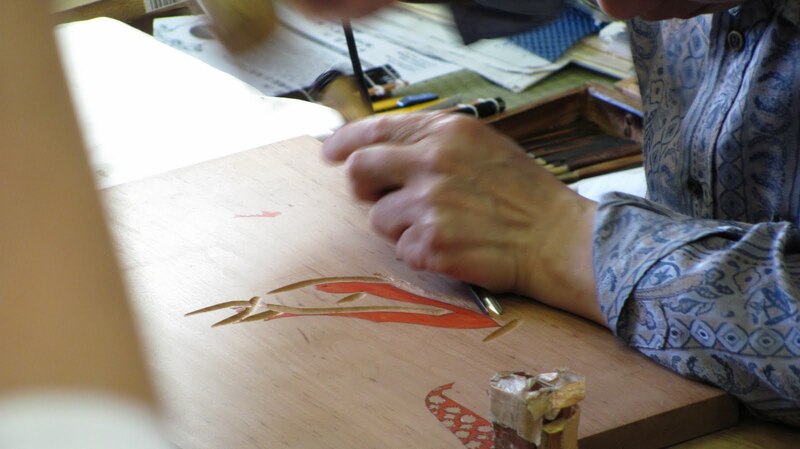 In the first day's demonstrations of Kyoto-style printing and traditional carving, I went over to watch traditional Ukiyo-e carver, Mr. Hiroshi Fujisawa carving a cherry block. 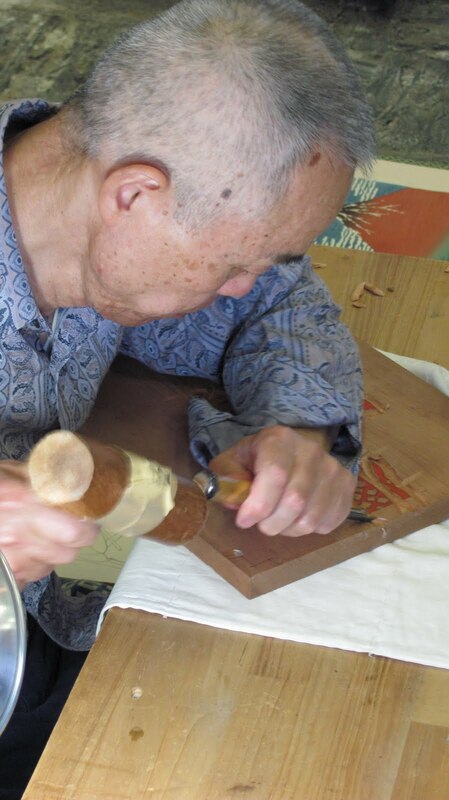 I didn't take photos of the first part as I was watching too closely--he carved the outline of these shapes using a hangi-toh chisel--a pointed chisel to incise precisely against the edge of the shape using two to three cuts. These would serve as stop-cuts to be cleanly edged away using an Aisuke or bull-nosed chisel to cleanly pare away the wood up to the incised edge. But before that he had to clear away all the waste wood, that which would not print. Here in these four photos he is using a mallet and curved chisel to rapidly clear almost up against he already incised shapes. I was quite taken by how quick he was and how close to the carved shapes he was clearing--I haven't the control to work that close so it takes me a lot longer. 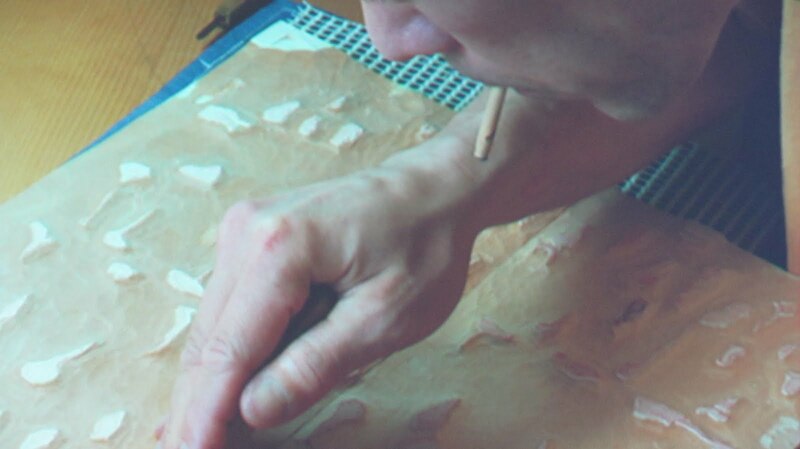 Finally using a much wider, shallower chisel he finished clearing the areas around the printing surface. He cleared the blocks much the way I would use an eraser to clean off a blackboard. Tap, Tap, Tap large chips of wood were flying. He has carved peg holes in his low work bench and there is a bench dog(that square peg) the board is butted against to keep it from sliding away. he did in about an hour what would take me at least a day. 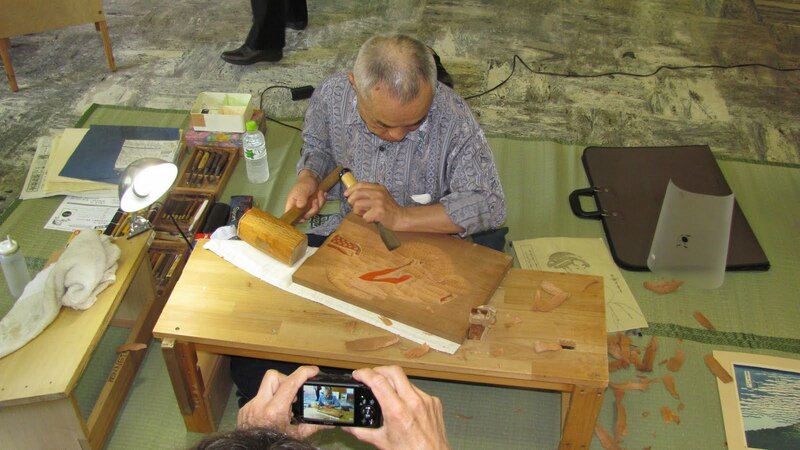 Later that week on Awaji Island, Mr. Shoichi Kitamura(carving) and Mr. Makoto Nakayama (printing) led a panel discussion and presentation of "Mokuhanga in Japan Today--Collaborations between Craftsmen and Artists" detailing and providing examples of their work done in collaboration with Artists from the UK and Australia. 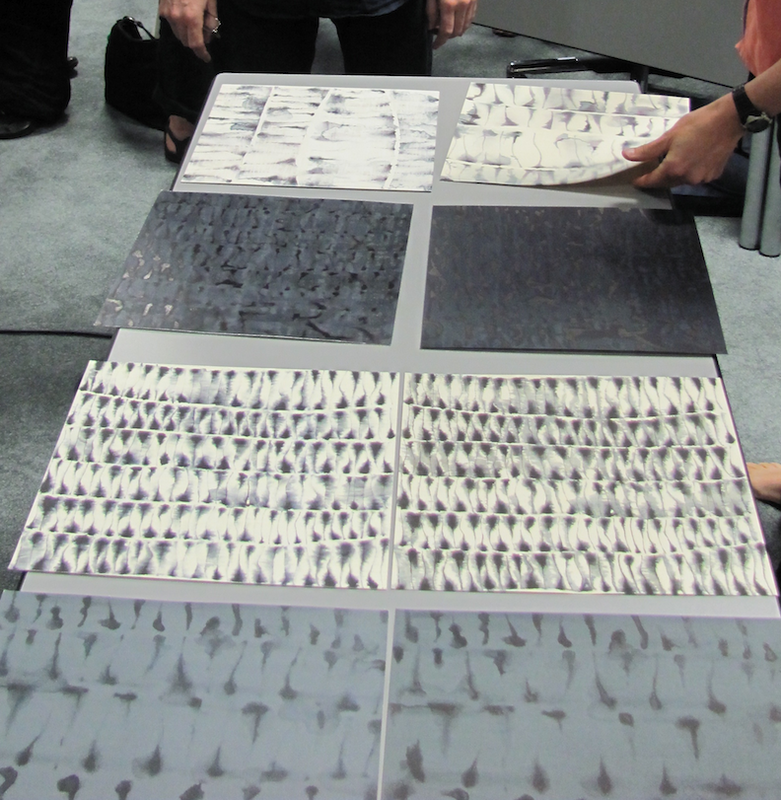 On the left are her original paintings that were used by the studio to prepare blocks and print from. On the Right are the woodblock prints. The drawings by themselves werea already very special but it was the reworking of them as woodblock prints using ukiyo-e traditional methods and the amazing richness and depth of color and surface that was quite remarkable for me as a "striving-to-improve" neophyte woodblock artist. There were obviously subtle differences-they were not identical but they were gorgeous and it was quite eye-opening for me to see the reproduction of splotchy ink drops and bleeding/seeping ink marks reproduced using multiple blocks and over printings. They talked about the range of techniques that could be used; printing on the back to have the color bleed through, careful multiple bokashi-printings, etc.etc. 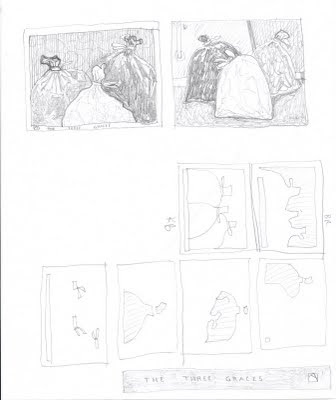 One not-so-obvious revelation was the careful division of the block to be printed into sections and small areas of bokashi might be printed section by section rather than trying to accomplish it all at once. Here below is one process photo during the carving of one of the blocks and the carver holding a piece of dried equisitum (Horsetail plant) which has a raspy/sandpaper like surface used to sand down the edges of the shapes to allow for softer printing. (that's NOT a cigarette in his mouth but a small piece of dried horsetail being moistened). They spoke a bit about how challenging this project had been for them but how they enjoyed the challenge and welcomed future work and collaboration with fine artists to realize works using traditional moku hanga techniques. All I know is I can't wait to try printing an ink blotch--on purpose. ( I get quite a few by accident...). 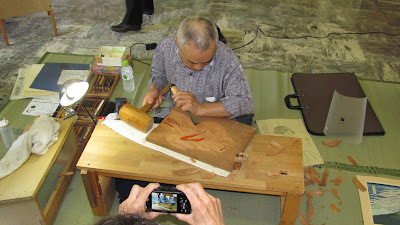 I was fortunate to be able to attend the 1st International Conference of Moku Hanga (IMC 2011); a conference of international artists, artisans, scholars and historians of Japanese woodblocks that was held in Japan in the cities of Kyoto and Awaji Island in early June. I took some photos, but was often too absorbed in what was happening to take decent pictures. 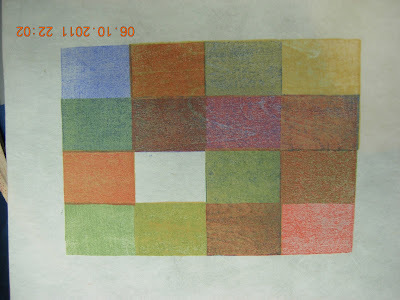 In the second half of the conference on Awaji Island; A demonstration of contemporary woodblock prints and printmaking by a group of Japanese publishers and professional printers included these prints of a simple demonstration of the effects of overlapping colors. This color exercise was one I had long hoped to do myself and was happy to see so clearly illustrated. Special thanks to Lawrence Pinto, another conference participant who was in this session who had the good sense to take these photographs, and the courtesy to send me JPEG copies to share. Four blocks were carved in a grid pattern with three primary colors and one secondary color. They were carved in such a way as to show the effects of overlapping color. Each of the original block colors falls on one of the corner squares in the composite image above. 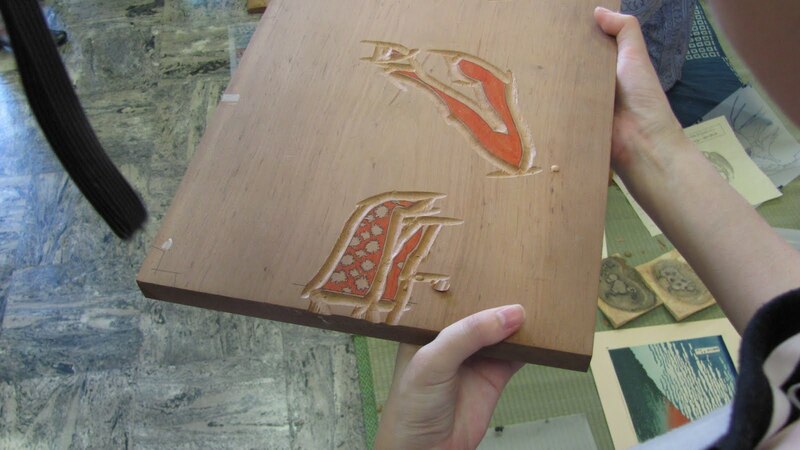 Since traditional moku hanga, japanese woodblocks are printed with transparent, water-based colors, the paper shows through the printed color giving them a luminosity they wouldn't have if they were opaque and simply reflecting the ambient light. Transparent blue over yellow will give green, red over yellow, orange; et cetera. What isn't easily imagined is what happens when you change the sequence of color; yellow over blue will yield a different effect than blue over yellow and in this particular exercise the forth block was green; the effects and browns/greys obtained would be different if it had been orange or purple. Similarly a cool red vs a warm red, yellow or blue will shift everything again towards a different green/brown/grey. The last two illustrations are the code for the grid so you can change the colors and try it for yourself. P.S. The code illustrated in the last two pictures will give you a similar print but different from the one actually illustrated: the four pure colors run across the top of the graph in the map, but on the opposite corners in the actual print.